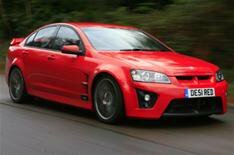 Even more power for Vauxhall VXR8 | What Car? Vauxhall's VXR8 will come with an even bigger V8 engine from this summer. The latest 6.2-litre unit, which is 195cc larger than the current V8, has 14bhp more power, giving a total of 422bhp. Manual cars now benefit from swifter in-gear times: 50-70mph in third gear drops from 2.8 to 2.6sec and 30-50mph in second gear drops from 2.0 to 1.9sec. Cars with an automatic gearbox can now accelerate from 0-60mph in 4.9sec, down from 5.0sec. Fuel consumption and emissions remain the same, averaging 18.5mpg and 365g/km of carbon dioxide. Buyers can also choose white bodywork and opt for 20-inch alloy wheels. Prices for both manual and automatic versions rise by 485, starting from 35,695.